The Transmission Physician is Cottman’s way of honoring all the women — past, present, and future — who’ve helped build the auto repair business into one of the largest, most important industries in the world. 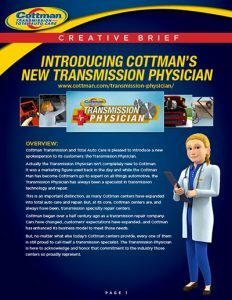 The Transmission Physician Educational Video Series focuses specifically on Transmission-related repair tips, which is an important distinction, as many Cottman centers have expanded into total auto care and repair. But, at its core, Cottman centers are, and always have been, transmission specialty repair centers. Cottman began over a half century ago as a transmission repair company. Cars have changed…customers’ expectations have expanded…and Cottman has enhanced its business model to meet those needs. But, no matter what else today’s Cottman centers provide, every one of them is still proud to call itself a transmission specialist. The Transmission Physician is here to acknowledge and honor that commitment to the industry those centers so proudly represent. You start the engine put your car in gear, and nothing. The car won’t move. And you see dollars flying away, because you figure you’re going to need a transmission. Well, maybe but there’s a good chance it’s something else… something a lot simpler — and cheaper! You’re driving down the road, when all of a sudden the “check engine” light comes on and now the car seems to have no power and it won’t shift properly. Relax; chances are it’s not the transmission at all. Checking the transmission fluid used to be as simple as checking your engine oil. Not anymore… Today’s cars used a variety of transmission fluids. So, to make sure no one adds the wrong type manufacturers limit access to the transmission fluid. You just had your transmission rebuilt and it seems to be working fine but the shop wants you to bring it back for a 10-day recheck. Don’t worry, there’s no problem. The 10-day recheck is a valuable part of the rebuild procedure. No doubt about it: auto repairs have gotten expensive and automatic transmissions are no exception. But don’t get the wrong idea; no one’s getting rich fixing your transmission. The parts make up a sizeable portion of the bill. You start your car put the transmission in gear and nothing happens. Suddenly you realize you need to choose a transmission shop, but which one? Consider using a shop with ties to a larger company or association. Their transmission physicians will be glad to check your car’s performance and let you know whether you have a real problem, or your car’s just reacting to the changing seasons and, if it is a real problem they’ll get it fixed and get you back on the road again. A basic transmission service only replaces a small part of the transmission fluid. Most of the old, worn-out fluid remains in your transmission. A fluid exchange service replaces nearly all of the fluid which helps keep your car’s transmission on the road much longer.